The EMB-505 is the official model name for the Embraer Phenom 300 light jet. The EMB-505 model name is the name of the Embraer Phenom 300 aircraft for the FAA and other aviation regulators. When looking for information on the Phenom 300 also consider that the EMB-505 is the official airplane model name for the Embraer Phenom 300. Learn more about the EMB-505 aircraft or light jet by visiting the following EMB-505 aircraft information pages. EMB-505 Overview: An EMB-505 aircraft overview page. Read an overview of the Embraer Phenom 300 on this page. 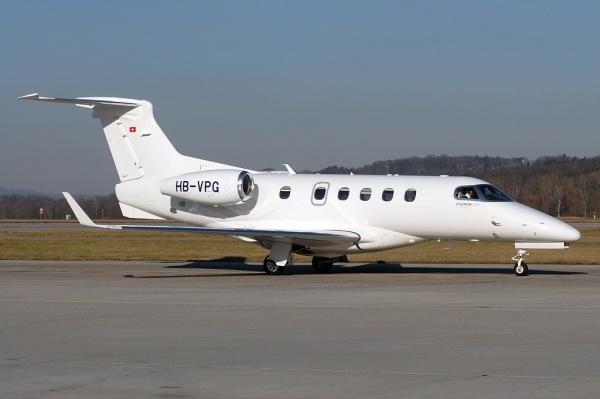 EMB-505 Price: Learn about the EMB-505 light jet's price on this page. EMB-505 For Sale: Find out about EMB-505 aircraft for sale. EMB-505 Specifications: Learn more about the EMB-505's specifications on the Phenom 300 specifications page. Above EMB-505 Jet photo by Rolf Wallner on Wikimedia Commons. Photo (only) released under a GNU Free Documentation License. EMB-505 Range: Information on the Range of the EMB-505 airplane. EMB-505 Performance: Details on the EMB-505 aircraft's performance. EMB-505 Cockpit - Flight Deck: Learn about the EMB-505's Cockpit/Flight Deck. EMB-505 Interior - Cabin: Get the details on the EMB-505 aircraft's interior or cabin. EMB-505 Platinum Edition: Learn more about the EMB-505 Platinum Edition aircraft. EMB-505 Operating Costs: Get the facts on the EMB-505 operating costs. EMB-505 Single Pilot: Learn if the EMB-505 aircraft is single pilot capable. EMB-505 Dimensions: Information on the EMB-505 dimensions. EMB-505 Type Rating: Information on the type rating for the EMB-505 airplane. EMB-505 Training: Get information one EMB-505 Training and providers. EMB-505 Fuel Burn: Details on the EMB-505 Fuel Burn. EMB-505 Simulator: Learn about the available EMB-505 Simulators. Visit the above EMB-505 pages to learn more about the Embraer Phenom 300.